We are pleased to announce that the Memorial is completed! Thanks to all for your prayers and financial support. Look for information about a grand dedication ceremony in 2019. Although we have raised the funds and paid for the Memorial, as you can see from the pictures, the site would be greatly enhanced with a bit of landscaping. If you are so inclined, can you send an additional donation to make the Memorial site a more beautiful place to honor the professors we so love? May you all have a fruitful Advent Season, followed by a Merry Christmas and a Blessed New Year. This is the Memorial as it looks from the bench directly in front.. This is a side view that gives a sense of depth to the Memorial. This is a larger picture with our esteemed Stoneworker, Keith Middlemas, standing beside the Memorial before Don Quixote was attached. St Lawrence Center is to the right, due south of the Memorial. To the left is the eastern tree line of the St Lawrence Center property. These photos are mostly taken indoors, in dim light. Forms and colors are much more keen when out in bright sunlight. I ask everyone to consider the geometry and mass of our elements. This is the same stone that’s on the Empire State Building. Grayish, now, it will turn a buffi-brown, within a year, just right to play off the rich, cupric colors in our bronzes. I hope everyone feels they have invested well. I’m pushing the best materials and techniques, even when nobody is looking. Why not??!! You should all be proud for attaching your soul to this little estuary where the public can pause to read and rest. 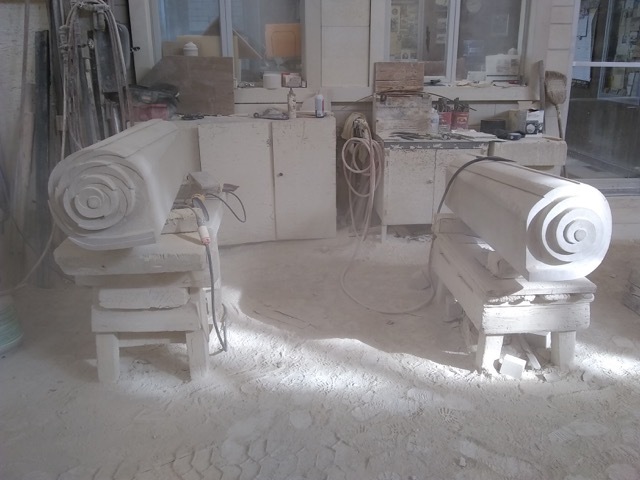 The work for the memorial is now in the capable hands of Lawrence stone mason Keith Middlemas who began carving the Indiana limestone in January. 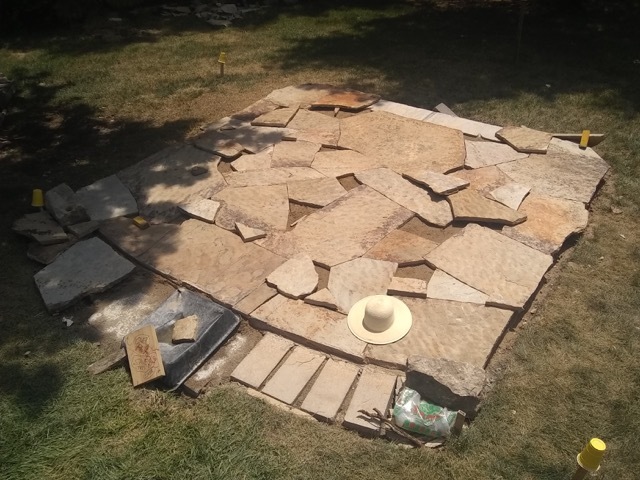 We are showcasing his sketches of the memorial and other images of the work in progress here on the IHP Memorial in progress page. The drawings you see here are from Keith Middlemas of Middlemas Stonedesign. If you have yet to donate, here is a wonderful opportunity! We need a retaining wall to accommodate a slope and redirect water from the memorial. 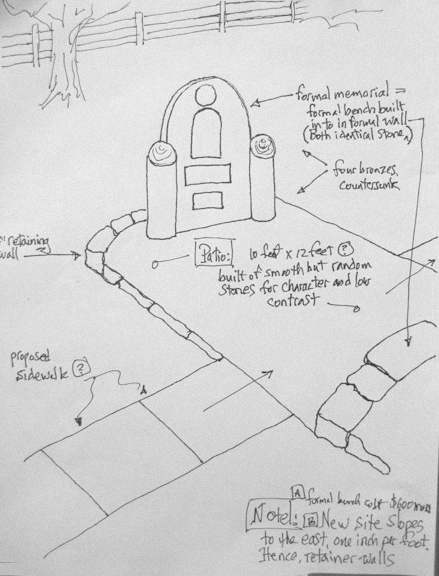 Keith has proposed building this of stone, installing a stone bench in the wall, and laying a stone patio between the wall and the memorial. These modifications add to the original cost. While our fund raising exceeded our goal, we still need help to meet these extra expenses and to help defray the costs of the dedication party. Visit our Donation Page.